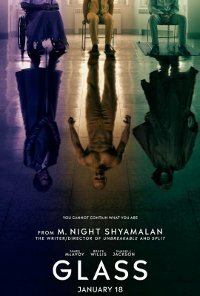 In some ways the third part of the trilogy that started with“Unbreakable” and continued with “Split”, and the characters of David Dunn, Elijah Price (Mr. Glass) and Kevin Wendell Crumb, who now has 24 different personalities. 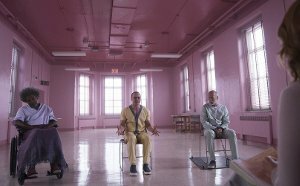 We pick up after the conclusion of “Split” where Glass finds Dunn pursuing Crumb’s superhuman figure of The Beast in a series of escalating encounters, while the shadowy presence of Price emerges as an orchestrator who holds secrets critical to both men. This film is releasing in 2D and IMAX. This is the 2D version. How can you put me in a room with these two crazies? Language Infrequent strong impact language. Violence Frequent strong impact violence that is both physical and psychological. Also contains scenes with bloodletting. Comments Glass is a psychological thriller containing complex and mature themes that explore super humans modelled much like those in the comic strips living amongst humans in real life; inquiring this phenomenon as a manifestation of a mental disorder; a conspiracy to suppress information; and the pursuit to finding one’s purpose and calling. The themes are treated with a sustained, strong impact sense of menace, suspense and threat that may be disturbing or upsetting to children under 16 who may not be cognitively developed, or suffer psychological harm as they may not be able to contextualize the fictional nature of the film.